The 1rst ESS prototype cryomodule successfully passes the RF power test! After more than 5 years of development, including 6 months of integration work of the 12,000 separate components to a complete cryomodule, the CEA-Irfu has just validated the technology of this complex system that reached the nominal ESS accelerating field in the 4 superconducting accelerating cavities. At the limits of technology, this is the first time that such an intense accelerating field, maintained over such long pulse durations and with such high RF power, has been measured in superconducting cavities installed in a complete cryomodule. This key step makes it possible to start the production phase of the 30 cryomodules that France is to deliver to the ESS research infrastructure, which will be operational in Sweden in 2023. This serial integration will begin in January 2019 under the supervision of Irfu with the contribution of the company B&S France and should be completed in 2022. ESS (European Spallation Source) is a European research infrastructure that will produce neutrons by spallation. These come from nuclear reactions resulting from the irradiation of a tungsten target by a beam of intense and high-energy protons produced by a superconducting linear particle accelerator. The construction in Lund, Sweden, began and the neutron source is expected to be fully operational in 2023. France is participating to the construction of the accelerator through in-kind contributions. 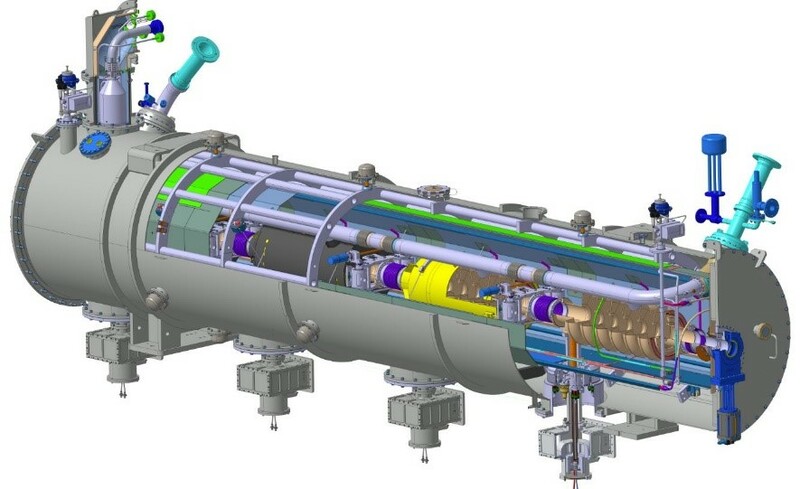 • the RFQ (Radio Frequency Quadrupole) which is the first accelerating cavity of the accelerator (low-energy, non-superconducting part) that accelerates and transforms the injected continuous proton beam of 75 keV to a pulsed beam at the energy of 3.6 MeV. • 30 cryomodules with elliptical cavities. Each cryomodule is a highly sensitive cryogenic complex system composed of 4 superconducting cavities equipped to accelerate protons. Each 6.6 m long cryomodule houses 4 superconducting cavities operating at 2 K, each powered by an RF power coupler transmitting up to 1.1 MW of peak power. The succession of 30 cryomodules along a total length of about 250 meters, accelerate protons from 216 MeV to 2 GeV. • 4 types of beam diagnostics that will allow measuring the beam intensity, the position of the beam center of gravity, the "quality" of the beam in spatial and energy distribution and the purity of the particles that compose the beam. • Elements of the control system. Before starting the production of the 30 cryomodules that will be installed in the accelerator tunnel, the realization and the test of a prototype cryomodule was naturally part of the development plan. • Mid 2013: based on the high-level parameters newly defined for the accelerator, the design of the ESS elliptical cavity cryomodules is launched in partnership with CNRS/IPNO. The CEA-Irfu is in charge of designing the cavity package that will have to reach accelerator fields at the limits of current technologies. In parallel, the CEA-Irfu (DACM & DIS) has developed a dedicated 2K RF power test station that allows the cryomodule to be tested under conditions similar to those of ESS. 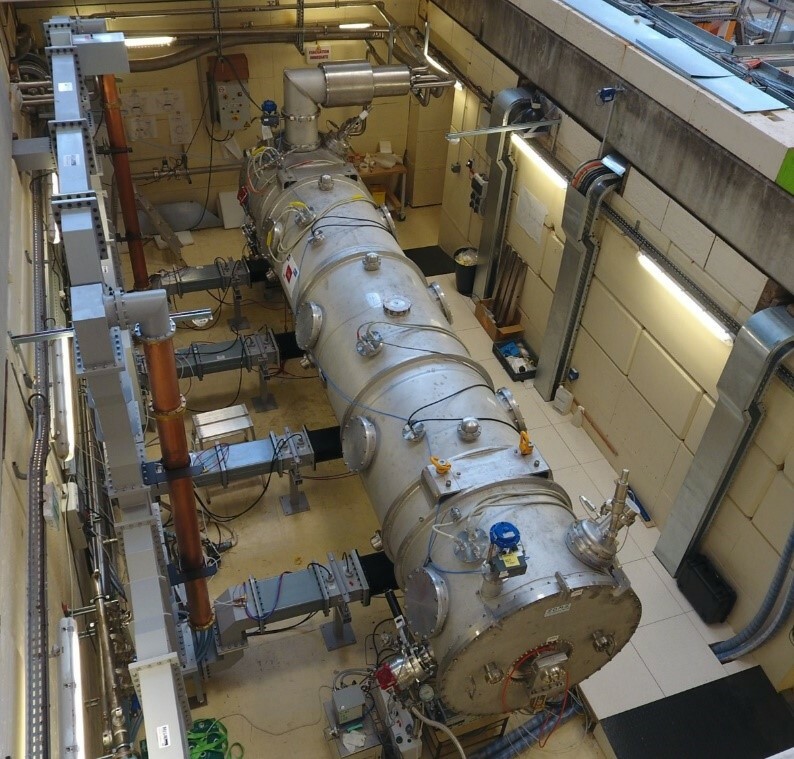 • At the end of August 2018, the prototype cryomodule was installed in the test station developed by the DACM and DIS, connected to the cryogenic cooling system and connected to the 1.1MW RF power source. • On September 26, in the presence of the ESS technical director and accelerator division head, the screens of the control room displayed the first accelerating fields at the ESS nominal requirements: 17MV/m with 1.1MW peak RF pulses of 3.6ms at 14Hz. This was the first time that such an intense accelerator field, maintained over such long pulse durations and with such high RF power, is measured in superconducting cavities that are fully equipped and installed in a complete cryomodule. • November 26th: last day of the RF power test campaign; 2 cavities are simultaneously supplied with RF power and each reaches the ESS nominal performances.